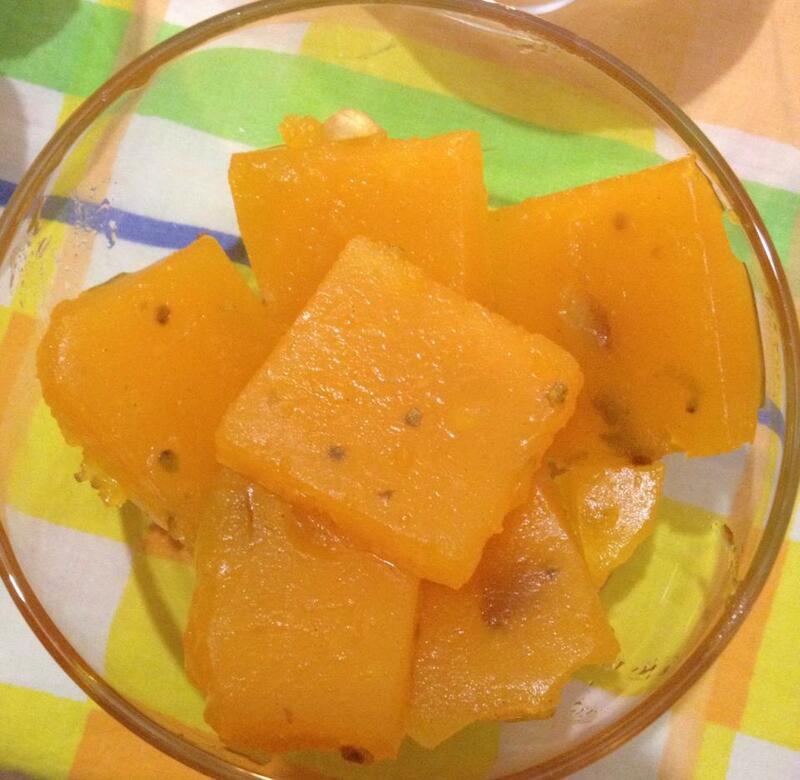 Wash the mangoes, pat dry, peel and cut into cubes. In a blender, blend well. If need be, add a little water while blending. In a heavy bottomed pan, heat ghee. Let it melt. Then pour the mango pulp, add sugar and stir well for about 5 to 10 minutes. Then pour in the corn flour mix little by little and keep stirring continuously on a medium flame (Stir continuously to avoid the formation of lumps). Once it thickens and starts to leave the pan, add a little more ghee, powdered cardamom and give one complete stir. By now, the quantity will be reduced. Switch off the stove. Remove from the stove and pour this over the greased tray. Allow it cool for at least 1 to 2 hours and cut them into pieces or cubes and serve. Enjoy! Cook the halwa on a medium flame to avoid burning of the halwa at the bottom of the pan. If you want, you can add ghee fried cashews or pistachios or raisins or sliced almonds before allowing it to set in the greased tray. I just kept it simple and relished the taste of mangoes alone. Instead of sugar, you can add sweetened condensed milk. Yummm… I’m definitely going to try this…. :):) Thanks for the recipe. Thanks Shalini 🙂 Do try it out! What a lovely recipe! Can’t wait to try it! Does this keep for long? Outside refrigerator, it stays good for 2 to 3 days. But when stored in a refrigerator, it may stay good for a week. But it is better to consume this mango halwa in room temperature without storing it in a refrigerator. Book marking to try this one…yummm! Thank you so much Tanusree. Do let me know how it turns for you..
haha.. Eating ripe mangoes as such is such a refreshing and enjoyable experience. Nothing beats the taste of fresh ripened mangoes. Do try this recipe, you may like it..
Looks soo yum. I’m drooling at the moment. Mango halwa looks delicious. Nice color. Inviting. Thank you so much Gayathri. You have a lovely blog too. I am still exploring yours!